Let me tell you about my favorite way to spend an afternoon in San Francisco: I walk up the easy slope of Columbus Ave, starting at the base of the Transamerica Pyramid, passing the copper green flatiron building owned by Francis Ford Coppola, and stopping just short of Broadway, at Jack Kerouac Alley. 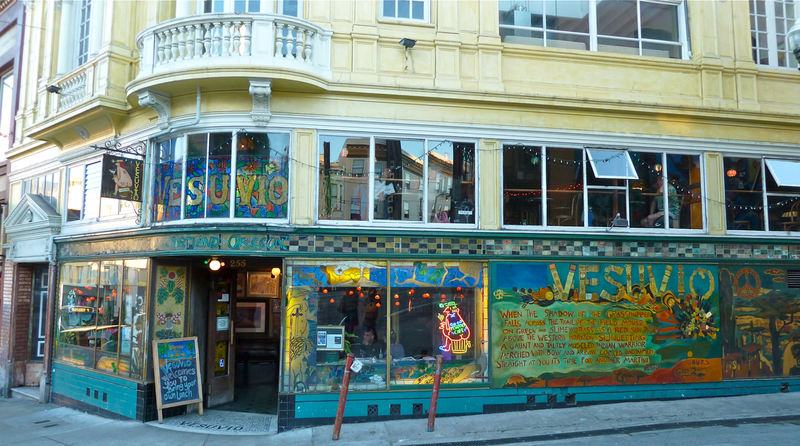 Here, you’re standing at the world’s greatest literary intersection, the home of City Lights Bookstore and Vesuvio Cafe. First stop is City Lights. The store, which celebrated its 60th Anniversary last weekend, was founded by Beat poet Lawrence Ferlinghetti in 1953. 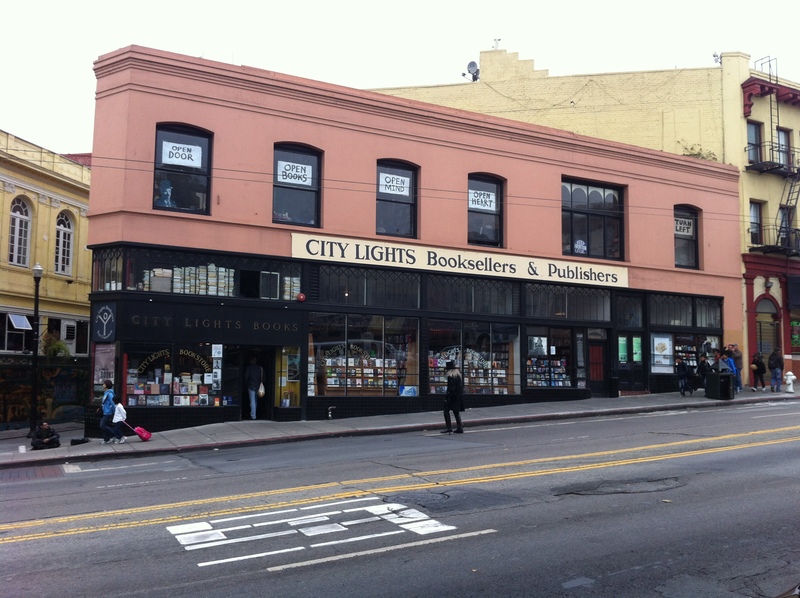 It’s a place that reeks of literary history–City Lights published Allen Ginsberg’s seminal (no pun intended, I swear) Howl in 1956, which led to Ferlinghetti being put on trial for obscenity (he was acquitted in a landmark court decision). City Lights has since published work by numerous other luminaries, including Frank O’Hara, William Carlos Williams, Malcolm Lowry and any major Beat poet you can think of. More than just being a place of historical value–the city of San Francisco named it an official historic landmark–it’s the rare place where you feel instantly that books matter, and that everyone else in the place feels the same. The store has a fantastic selection of independently published books, and the top floor features a poetry section which is unmatched south of Portland’s famed Powell’s. 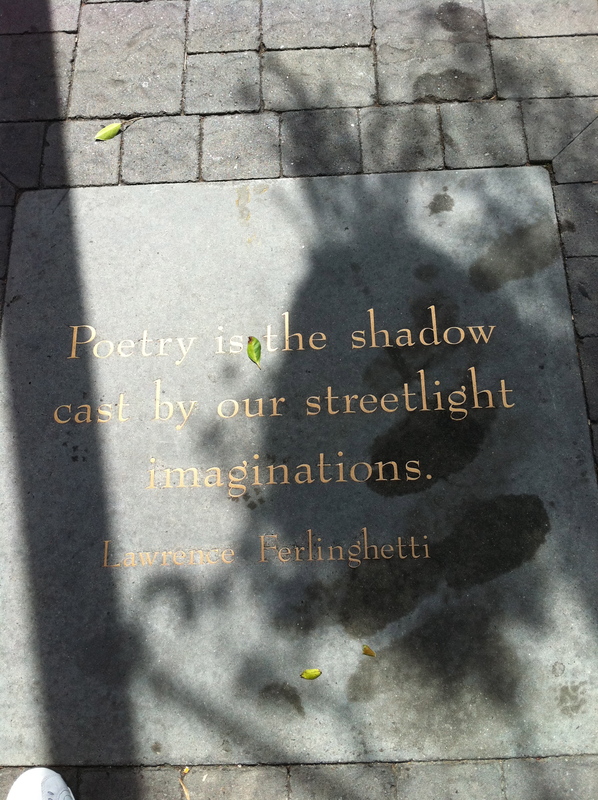 After about an hour of browsing the shelves at City Lights, I’ll take a few newfound treasures back across Kerouac Alley, stopping to look at the engraved stone poetic quotes from Kerouac, Felinghetti, Steinbeck, Maya Angelou, and more. 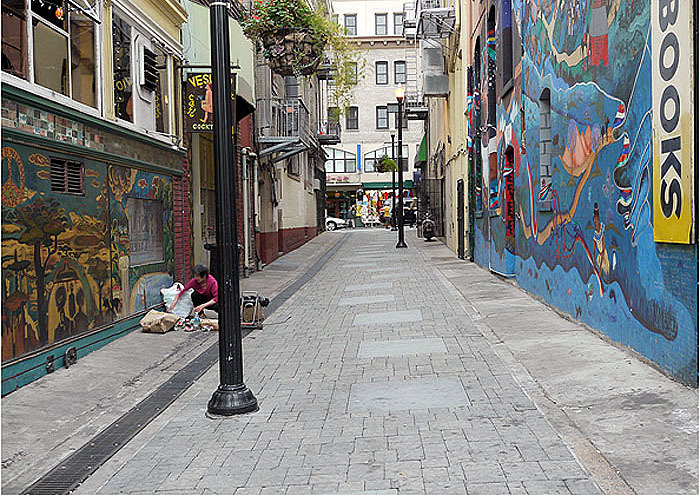 There are murals on either side of the alley, and often you’ll see buskers playing music here. Looking down Kerouac Alley toward Chinatown. City Lights is on the right, Vesuvio on the left. After crossing the alley I walk through the narrow door of Vesuvio, my favorite bar in the world. The bar opened in 1948 and became a hangout for the Beats. It’s adorned with photos of Kerouac, Cassady, Ginsberg, as well as rock stars, like Bob Dylan and Janis Joplin, who’ve hung out here. The opening sequence of an early Dave Chappelle HBO special was filmed at Vesuvio. And on a personal note, two good friends of mine who are now married met at a birthday party of mine at Vesuvio. I always joke that I like to think they made out in the same booth where Kerouac and Cassady once did. Anyway, I walk through the door of the bar, order a Maker’s on the rocks or an Anchor Steam (or maybe both), and go up the narrow, winding staircase to the second floor. I get a seat by the window and sip my drink leisurely. I read a little bit from one of the books I bought at City Lights, or I’ll jot some thoughts in a notepad, or I’ll just sit and watch the tourists and the beatniks on Columbus Avenue. As far as I’m concerned, it’s the perfect San Francisco experience. This entry was posted in Books, Drinks, Travel and tagged allen ginsberg, bars, city lights, dave chappelle, Jack Kerouac, literature, north beach, San Francisco, the beats, vesuvio. Bookmark the permalink. I too have spent many an hour at Vesuvio and City Lights. Nothing beats a nabbing a second floor window seat and wiling away a stolen weekday afternoon. Nothing beats making out with a wasted chick in Vesuvios’ men’s bathroom. Reblogged this on Jamie Godwin Brooks.